The Squatina Africana, also known as the African Angelshark, is a continental shelf and upper slope shark that occurs mainly in the Western Indian Ocean. This species belongs to the family of Squatinidae. 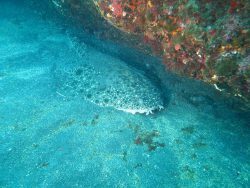 Biology: The African Angelshark is greyish and… read more. The Angelshark or Monkish was first described in 1758 by the ‘father of taxonomy’, Carl Linnaeus. They are one of the largest types of Angelsharks, with females reaching up to 2.4m. Males are smaller, with a maximum length of 1.8m…. read more. The Angular Angelshark, sometimes known as the Spiny Angelshark, lives in subtropical waters off the coast of Brazil, Uruguay and northern Argentina. They are endemic to this area and are usually found at depths between 2 and 265m. They’re currently… read more. The Argentine Angelshark is endemic to the southwest Atlantic. They can be found from Brazil to all the way down to Patagonia, the southernmost tip of Argentina. 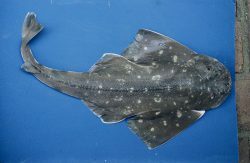 Like all Angelsharks, they have wide, flat bodies and large pectoral fins, which… read more. 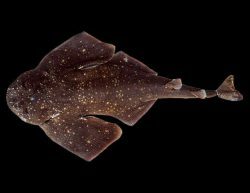 The Squatine Dimeril Shark, also known as the Atlantic Angel Shark and Sand Devil, is found in the western Atlantic in depths up to 1,290 m. Belongs to the Squatinidae family. Biology: A ray-shaped shark, its head is narrowing to… read more. The Australian Angelshark is a common species endemic to southern Australia. The population for this species has been monitored for 11 years from 1994 to 2004 which showed that the current population trend has been stable. Biology and Behaviour Australian… read more. The Chilean angelshark is a shark species found in the Eastern Pacific, from Colombia to Chile. It lives on the continental shelf at depths of 30 to 75 m. It is one of several similar angelsharks in the region. Like… read more. 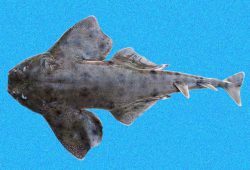 The Clouded Angelshark is a relatively unknown species and is often misidentified as the Taiwanese Angel shark. They are one of the largest in the family, reaching up to 1.63m in length. They inhabit the waters around Japan and Taiwan… read more. 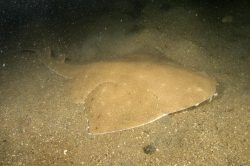 Do you have images or videos of Angelsharks – Squatiniformes?